Our kidneys are working all day and night to ensure that toxic substances and waste products are filtered from our body. It also regulates the amount of fluid in the body as well as the different minerals and salts that are essential for various processes. Although we can remain healthy even if we only have one kidney, both kidneys are constantly working to maintain the state of balance (homeostasis) that marks health. As with any part of the body, the kidneys can become dysfunctional, damaged and diseased. The symptoms may not be immediately obvious unless it is a severe kidney problem that strikes suddenly. But identifying the early and subtle signs of kidney disease and seeking medical attention as soon as possible can drastically improve the outcome. There are a range of different kidney conditions that are diverse in nature. It is rare for a single condition to affect all parts of the kidney and associated structures. Instead the problem may lie with the blood vessels to and from the kidney (renal artery and renal vein), the kidney tissue itself or the ureter that carries urine out of the kidney to the bladder. The symptoms of kidney problems are largely the same. If you suspect that you have a kidney problem then you should speak to a doctor immediately. Urine dipstick tests can be bought over-the-counter and the consumer varieties will be able to give you a general indication of whether there is a problem or not, as well as the type of problem. However, more definitive tests need to be done by a doctor. Here are some of the signs that your kidneys are unhealthy. Only a medical professional can reach a conclusion about the type of kidney problem that you may have, usually after conducting various scans as well as blood and urine tests. Ideally urine should be a pale yellow in color. People who drink more water may have very light-colored to almost clear urine and this is also normal. With lower water intake, urine becomes a mustard to dark yellow color. This may not be a problem either but it should prompt you to drink more water in a day. Urine that is red, pink, orange, brown or black in color is abnormal and may be the sign of various diseases. Of these, red to pink-colored urine is more commonly encountered and it usually a sign of blood in the urine (hematuria). However, it is important to note that blood in the urine in many instances causes no visible changes in the urine color. 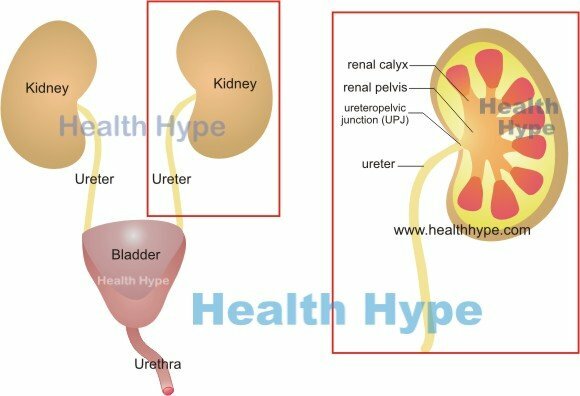 Urine is approximately 95% water, 2% urea and the other 3% is composed of uric acid, ammonia, creatinine, calcium, chloride, magnesium, potassium, phosphate, sodium and sulphate. There may also be byproducts of metabolized drugs and other substances in the urine. However, some substances in the urine may be a sign of unhealthy kidneys. This is mainly protein or blood. While blood may cause changes in the urine color, protein is usually not visible. However, protein in the urine (proteinuria) can cause frothy or foamy urine. Pus in the urine as a result of infection causes it to become cloudy or murky. Sometimes protein, excess calcium and even vaginal discharge can cause cloudy urine. Normally a person will pass out anywhere between 500mL to 3L of urine per day. By drinking the required 2 to 3 liters of water daily, an adult should urinate approximately 1.5L to 2L with fluid also being lost through the skin, stool and breath. This can vary depending on various factors like level of activity and environmental temperature, as well as the amount of fluid a person drinks in a day. In the event of kidney problems, a person may pass out in excess of 3L per day (polyuria) or less than 500mL per day (oliguria). Passing less than 50mL per day or even no urine is known as anuria. Since the human bladder holds about 500mL, in polyuria a person will notice that they have the need to urinate many times in a day – frequent urination that more than regular. Awaking at night to urinate (nocturia), if it occurs many times at night, also occurs with polyuria. The natural odor of urine can vary depending on the amount of water a person drinks, their level of physical activity, the environmental temperature and even the foods they eat (for example with asparagus). It is possible for the urine to have almost no odor if you drink sufficient quantities of water and urinate often. However, in most cases urine has a musty ammonia odor due to the urea and small amounts of urea in it. This odor can be very strong and overpowering when the urine is concentrated but it is still within the norm. Urine odor can be considered abnormal when it has an almost sweet smell or an offensive fishy odor. The causes of this can vary but sometimes the problem is not in the kidney itself. Liver disease, diabetes, a host of other conditions and even some vitamin supplements can alter urine odor. Pain in the kidneys is a very obvious sign of a kidney problem but it is difficult to isolate whether it is in fact kidney pain. The kidneys lie in the abdominal cavity which is congested with organs that lie close to each other. Identifying pain at a certain spot as being due to a specific organ is therefore difficult. Kidney pain, when present, tends to be in the upper part of the abdominal cavity towards the flanks and the back. Since the position of the kidney changes when standing up or lying flat, as well as to some extent with breathing in or out, the location of kidney pain may change accordingly. Burning upon urination is a more definitive sign but it is rarely due to a kidney problem. Instead burning when urinating is more likely an indication of a urinary tract infection (UTI). Swelling of the legs as the kidneys are unable to expel sufficient water from the body through the urine (fluid retention). Nausea as urea and other waste products build up in the bloodstream. Shortness of breath as the blood pH changes and the breathing rate alters to compensate. However, there are many other signs and symptoms of kidney problems ranging from a pale sallow complexion to headaches, muscle cramps, fatigue, confusion and even seizures.